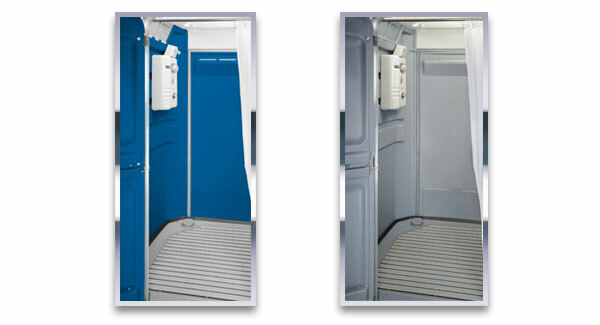 Our roomy Fleet cabin is fitted with a shower grated floor, shower curtain, and built-in light to provide a portable shower solution that can accompany your portable restroom and portable sink rentals. Push button operation dispenses warm water for approximately 30 seconds before automatic shut off. Dispenses 2.5 gallons / 9.5 liters of water per minute. Requires pressurized, fresh water source and a connection to a grey water sewage disposal system. Check out our Waterworks Fresh Water Delivery System. 15 amp / 115 volt power supply is ground fault protected (GFCI).